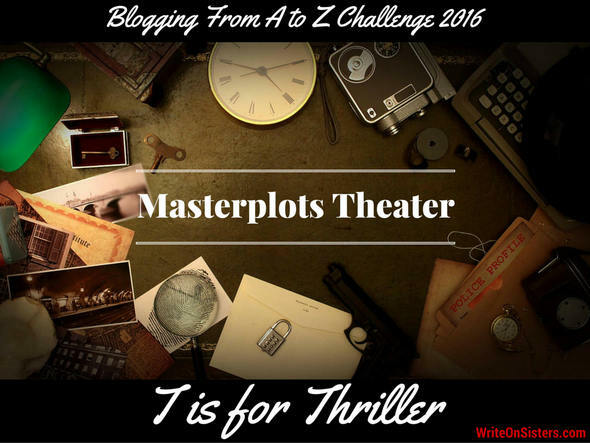 Welcome back to Masterplots Theater! Is your story about a someone on a mission to stop a murderer? Great! But do you know whether it’s a thriller or a mystery? If you’re like me, you might have answered, “It’s both — a mystery thriller!” Thing is, I’ve discovered that mysteries and thrillers are not the same, and though each can have elements of the other, it’s helpful to understand the difference. So today’s episode won’t simply be a study of one masterplot, but rather a comparison of two. The first main difference between thrillers and mysteries is something I’ve dubbed crime timing: In a mystery, the main crime has already been committed (or happens right at the beginning of the story). In a thriller, the crime (at least the main one) hasn’t yet been committed and isn’t scheduled to take place until the climax of the story, and that creates the impending feeling of doom and intense suspense that comes with the Thriller masterplot. The second crucial difference is the hero’s goal: in a mystery, the hero (and reader) aims to figure out who committed the crime; in a thriller, the hero strives to stop the villain from committing the crime. And if the hero doesn’t yet know who the villain is, he will at least have an idea of who it could be. In a thriller, the pacing is fast. Stuff happens in an almost relentless seesaw of suspense and scares that yank the audience’s emotions back and forth and keeps them on the edge of their seats. However, mysteries are more of a controlled slow build as the clues pile up. The level of danger also differs. In a mystery the hero is not in imminent danger, though the danger increases as the hero gets closer to discovering the identity of the criminal. But in a thriller, the hero is in danger from the beginning. POV is also quite distinct between these two masterplots. In mysteries, the audience/reader is only privy to what the hero knows. This makes for a lot of close 3rd person POVs in mystery novels. In thrillers, the audience/reader often knows more than the hero. This makes omniscient 3rd person or multiple POVs (including the criminal’s) the perspective of choice for thrillers. As you may have guessed, different POVs affect plotting significantly. In thrillers, the audience often knows more than the hero and is waiting on pins and needles for bad things to happen to the less-informed hero. Knowing something is going to happen but not when is the key to suspense, which is the thriller’s calling card. Whereas in a mystery, the audience will not know more than the detective and is uncovering the clues as the hero does. That’s not to say that mysteries can’t be suspenseful, but that suspense won’t ramp up until the hero and reader have amassed enough clues to get an idea of what dangers could befall them. · CRIME TIMING: Mystery. Before the first line of the book, a murder has been committed and the main character, Jazz, is watching the police inspect the scene. More murders will happen before the story is over, but there isn’t an imminent big crime that the killer is working towards, at least not to the hero’s knowledge. · HERO’S GOAL: Mystery. Jazz aims to find out who this new serial killer is before the town starts suspecting him, the son of an incarcerated murderer. · PACING: Ooo, this is a tough one. Though this book starts off with mystery pacing, it enters thriller pace in the last half. But if I read my own paragraph on pacing, I guess that still means this is a mystery that simply ramps up as the hero gets closer to unmasking the murderer. · DANGER: Mystery for sure. Jazz is in no personal danger at the beginning of this story. He doesn’t even fit the victim profile! Not until his investigation brings him close to identifying the killer is his life on the line. · POV: Mystery & Thriller. Like a mystery, Jazz’s POV is close 3rd person and we don’t know anything he doesn’t… until we encounter the killer’s POV. 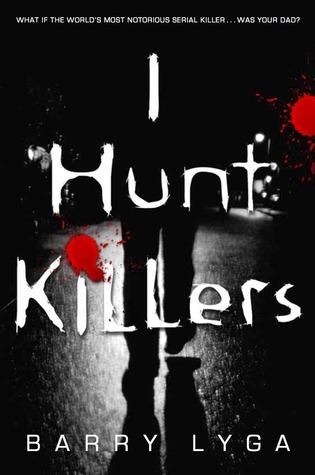 Though the killer doesn’t identify himself (leaving that tidbit for the end mystery solve), having insight into the killer’s mind brings this novel into the thriller realm because we learn what nefarious things the killer is up to and that creates suspense and concern around the fate of the other characters in the book. When trying to think of examples, I realize I’m most familiar with Mystery-Thriller Hybrids. You can apply the Plot Notes yourself to the following films, because they all lie more on one side than the other, to see how the masterplots fuse together: SILENCE OF THE LAMBS, THE DEPARTED, and SEVEN. For a more pure look at the Thriller masterplot, Alfred Hitchcock is your man. He’s famous for illuminating how suspense means that the audience knows more than the hero. Start with the film THE 39 STEPS. Also helpful to note is that other masterplots, especially Pursuit and Horror, fit into the Thriller genre too. Thank you for joining us today. We hope you enjoyed T is for Thriller and we invite you back tomorrow for our next installment of Masterplots Theater, U is for Unrequited Love. Now for a show of hands: Have you ever struggled to decide whether you were writing a mystery or a thriller? Thank you for the discussion about the difference between thriller and mystery. I can see that endless action and suspense would be more essential to thriller while the forensics of how a crime occurred is the venue of mystery. Yep! And figuring out how to balance those things for a mystery-thriller hybrid is always the tricky party. 😉 Thanks for the comment, Sharon! I’ve been waiting all month long for this post and was not disappointed. I’m writing what I believe is a thriller, but after reading so many articles that attempt to explain the difference between the mystery, suspense, thriller genres, I often find myself confused and wondering if I’ve properly tagged my novel with the appropriate label. After reading your post, I feel better and I think it falls clearly within the mystery – thriller hybrid. I haven’t read the book you chose for our example to study, but the student in me who can’t pass up a chance to improve or master her writing skills, I’m compelled to read it right away and deconstruct the plot. I’m always searching for movies and novels to read and watch that will help me become a better writer. All three of the movies you named are movies, I’ve watched over and over. Silence of the Lambs has been a long time favorite. I’ve read the book and deconstructed the plot, piece by piece and deconstructed each of the main characters. I’ve also watched the movie a million times. The Departed is another favorite I’ve watched over and over, as is Se7en. I’m a sucker for twist endings. I agree with you on anything directed by Hitchcock. I’m curious, what you would label Presumed Innocent. Thanks, Sheila! Breaking stuff down into clear-cut parts is something I do for myself so I understand the concepts, and I’m glad passing that info on helps other writers too. I’ve always wondered what the difference is! When I was younger, I tended toward thrillers like the ones Dean Koontz writes. Now I like mysteries. I like for the murder to have already happened or not to witness it in detail if it happens at the beginning (like on shows like CSI!). I’m torn between what I like best. I enjoy being scared because I know what’s coming and the hero doesn’t, but I also love solving a mystery alongside the protagonist. Not surprising, I read a lot of hybrid mystery-thrillers. 😉 Thanks for the comment, Steph! This is an excellent article on the distinction between mystery and thriller! Thanks so much for choosing Thriller for T! I’ve learned so much from this piece and hopefully it will help me when writing my own thriller. Absolutely agree with this. I’ve blogged something similar myself in the past. Really liked this post! I love mysteries and thrillers a lot (I would never be able to write a mystery, mind you, but I’ve tried to incorporate thriller elements in my stories quite often). I have never really thought about what makes one plot or the other, but now that I’ve read your post, it makes a lot of sense. This is probably just me and the way my reader’s mind works, but I think all stories should contain at leas a few thriller elements. I agree! Every story needs some suspense. Thanks for the comment, Sarah! I’m so impressed by the depth of your posts. So much work went into each post. Thank you! I loved the distinction between thriller and mystery – it added another layer.